Perfect for working on playing a song! I am a guitarist and a singer, and this app helps me a ton. I can see the pitches so I know what scale I need to be in. Also when my band does songs, we typically drop it by a half step, which is perfect with this app. No difference in intervals. This is one of my most used apps! Thank you for making a great tool for music!!! 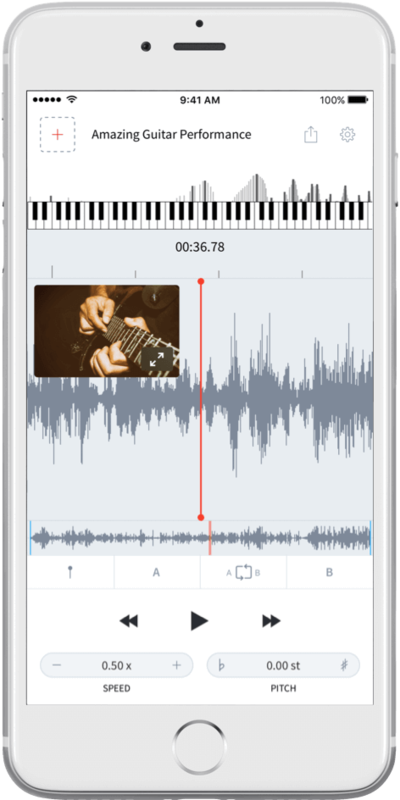 This app is a must have if you are into transcribing music. 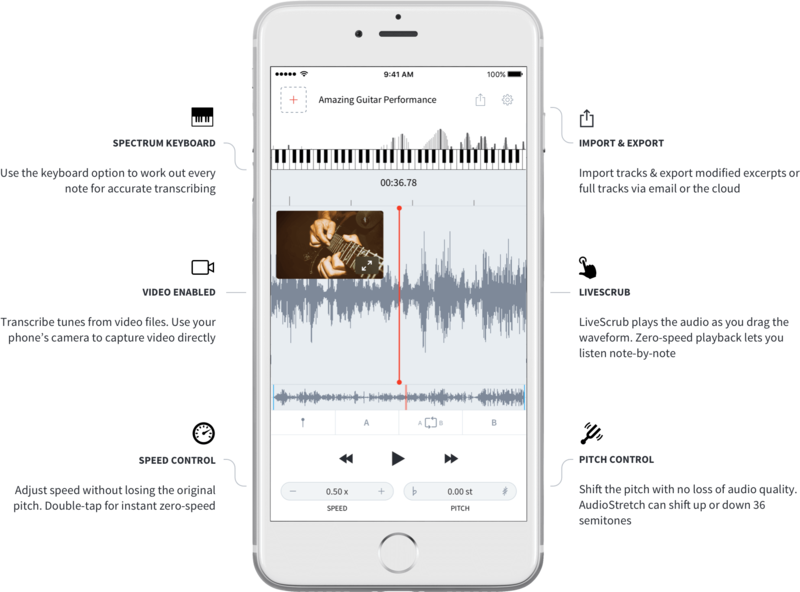 I have found no other program – mobile or desktop – that does a better job than AudioStretch of helping musicians decipher the harmonies and melodies of their favorite tracks so intuitively and so effortlessly. I would recommend it to all. This app is the perfect tool for anyone trying to learn to play a song. The 3 main features that make it so useful are its ability to (1) loop all or part of the song, (2) transpose the song by half-steps up or down, and (3) change the tempo. The app does these effortlessly and flawlessly. The 4th best thing is that you can then export the loops you make so they can be used in other apps or on your computer. It gets my highest possible recommendation. The answer to all my dreams. Speed up a backing track and change the key with good quality and send to other apps, etc... I love it. Worth ever penny. A gem of an app. The only app you need for figuring out solos...period! I don't usually write reviews, but I have been using AudioStretch for only a few days and I have to say this is the single most powerful tool for figuring out solos and fast/complex passages I have ever used! ... If you pride yourself as the type of person that learns songs, solos and riffs by ear, you need this app!! Change the speed of audio files without changing the pitch. Freeze it at zero speed to work out tricky chords and solos. Use the keyboard option to work out every note for accurate transcribing. Import tracks & export modified excerpts or full tracks via email or the cloud. Transcribe tunes from video files. Use your phone’s camera to capture video directly. LiveScrub plays the audio as you drag the waveform. 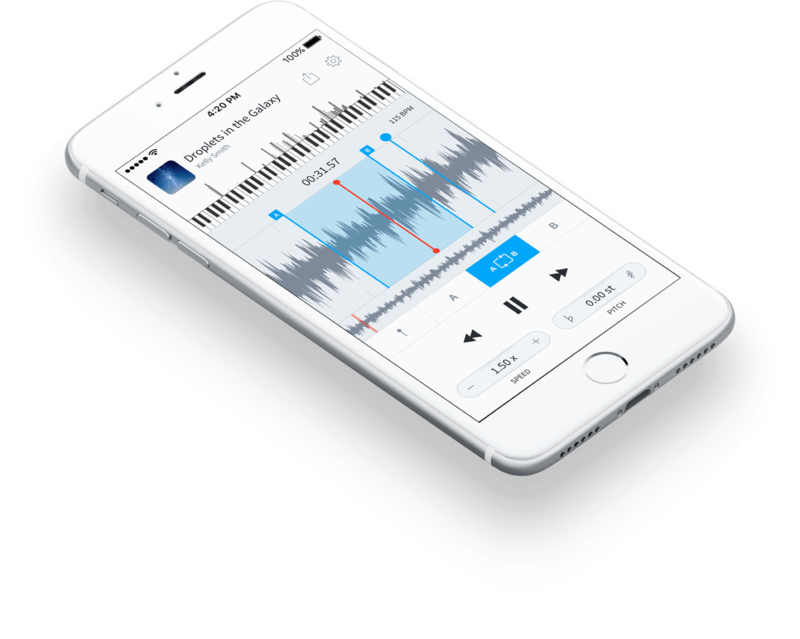 Zero-speed playback lets you listen note-by-note. Adjust speed. Drag left-right for fine adjustment. Double-tap for instant jump to zero-speed. Shift the pitch with no loss of audio quality.